and also the most important parts of his theory. Mills which measured the binding energies and structure. or physics I would by now calculate the s**t out of these molecules. calculation process and the results. Perhaps someone on "the internet"
book and the equations necessary to do the math. Mills has been making grandiose and largely unsupported claims for more than 20 years. Now, he's dumping a gigantic amount of power in a tiny volume and acts amazed that he gets a flash and some light. He's utterly ignorable. More than 20 years ago, he promised that high power plants were within a year or two of commercialization. Where are they? Mary Yugo wrote " utterly ignorable"
It's not original but will add it to my list of Yugoism's together with "I'm a nitwit. Makes sense". I think what Epimetheus was looking for was not a debunking by rhetoric , but by mathematical calculation. I have no interest in math which attempts to explain a phenomenon which does not exist. Math is not my field. But scams are. And someone who lies by telling people he has a very low cost, highly energetic reaction which he has reduced to practice, has been properly tested, and will be operational in two years... has been sold to utility companies... etc. etc. ... and nothing happens after more than twenty years and the guy is still taking money for a razzle dazzle meaningless demo? That to me spells s c a m. I am really shocked by how often OBVIOUS and cofirmed liars are believed when they speak new lies. Believing Rossi despite his horrible and dismal record is how IH and Darden got snagged into the current multi-million disaster they are deeply into. Epimetheus, you might be interested to read about a software app called 'Millsian'. Epimetheus.. No calculations here , but this interview with Andrea Calaon has a less unbiased view on Mills. Some experimental findings seem to be useful. lightyears away with vast amounts of money and research. when 90% of the problems are gone but when the device is ready. theory - hiding behind "SCAM-FRAUD" is not doing mankind any favor. software architecture with the knowledge that is available to that time. which are active when condition A,B and C are met but not D.
the masses for all of them. Gee Epimetheus, it's not all so difficult. Suppose what you say is true. All Mills would have had to write to retain credibility was that he was wrong about the timeline, exactly what error was made that led to the wildly overoptimistic time estimate, why he had made that error, how he had corrected it, and so on. Does he do that? Did he? Of course not! nstead, what does he do? He follows the usual scammer script. He keeps on making extravagant claims, never admits failures, makes more ridiculous projections, shows different and even more absurd demonstrations and on and on and on. You really need to become conversant with some scams we know are scams. Like the Steorn case, the Carl Tilley case, Dennis Lee, Bedini, Papp and all scammers way back to https://en.wikipedia.org/wiki/John_Ernst_Worrell_Keely. And let's not leave out Rossi and Defkalion. The pattern is always the same. The obvious victory and widespread vindication by main line science are always just around the time corner --next year, in two years and so on. And the device changes all the time. There is never time to do a proper consistent experiment proving that the current device works with replication. There is always a newer better QuarkX around the corner. Classic. Mills is different mainly in that he has convinced more smarter people. They should be embarrassed for never requiring him to deliver on his constant promises. The post was edited 1 time, last by Mary Yugo ( Sep 15th 2016 ). This link provides a short analysis of the math and CQM in general. Rathke had to withdraw is conclusion because he made some severe mistakes. We don't need abstract papers! There are many papers out there dealing with low orbits. Just make a search for Holmlid und you will find experimental confirmation of low orbits of H/D(0). We need more (sophisticated) and better experiments not silly QM papers. QM only works for a range of some few 10 eV. Rathke used errornously the 3D and not the 2D wave equation and even with that he made a sign error. He said in a yahoo forum that he published the paper just to prevent ESA to put money into the evaluation of Mills theory. So no...this is not a valid critique. I'm with Mary Yugo in this matter. To be fair, prof. Randell Mills is pretty smart a truly modern genius. His derivations of fine structure constant α and particle mass are worth of attention by itself. In addition, he's incredibly productive, given the immense pile of textbooks and articles, which he already produced. Also these books are well organized and thoroughly written and skillfully illustrated - which is in striking contradiction with many crackpots. Some other things about Randell Mills look more suspicious to me. His models of atom structure, Millsian software and electron orbitsphere models look quite naive with compare to standard quantum models, and they cannot explain the angled structure of water molecules, for example. The spherical shell models of chemical bond simply lack any deeper geometry. My objections against hydrino model were already presented here. In dense aether model the subquantum states could exist in essence but only as a highly metastable and endothermic states of hydrogen. Why hydrino doesn't condense all around us, if it's so dense? We have lotta iron and nickel in the universe, because these elements are product of many exothermic nuclear reactions - but no hydrino meteorites are still raining on our heads. And the attempts for characterizations of various hydrino compounds isolated probably didn't even pass Mills own standards - they were never attempted to replicate by his own team. 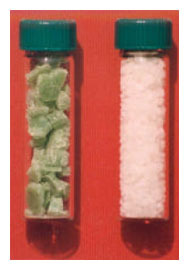 Which is strange, because just these tangible samples would confirm the relevance of hydrino model in most reliable way. At the end the BLP's experiments with evaporation of silver by supercap discharges apparently lack the basic control of energetic balance, so I'm forced to consider them only as a visual shows for investors without deeper substance. So that whereas Mills definitely deserves a success with compare to many other apparent fraudsters, I'm still forced to consider his own research poorly substantiated and ill defined. The post was edited 2 times, last by Zephir_AWT ( Oct 26th 2016 ). Hydrinos according to mills are dark matter - so it is pretty plausible, that we have not "seen" any hydrino meteroids, yet. But why the hydrino should behave like the dark matter, if it has quite different properties and it even supposedly forms compounds with normal atoms? The real reason these things succeed in the popular imagination is, we want SO badly for it to all be true. It supposedly does not have different properties. They even connect their measured spectra to space spectra where there is a lot of dark matter. It actually would make sense, that hydrinos are dark matter cause H is the most abundant Element in the universe - the only thing that is more abundant is dark matter (which would then be a lower energy level of H). I am not saying that his theories are correct (i just started to read his book), but at least in the first part i could not really find any flaws in his argumentation. Of cause you have to follow him with his idea of the electron but if you do that, everything else derives pretty straight forward. But: If his assumption about the elctron is wrong - everything else is wrong as well. 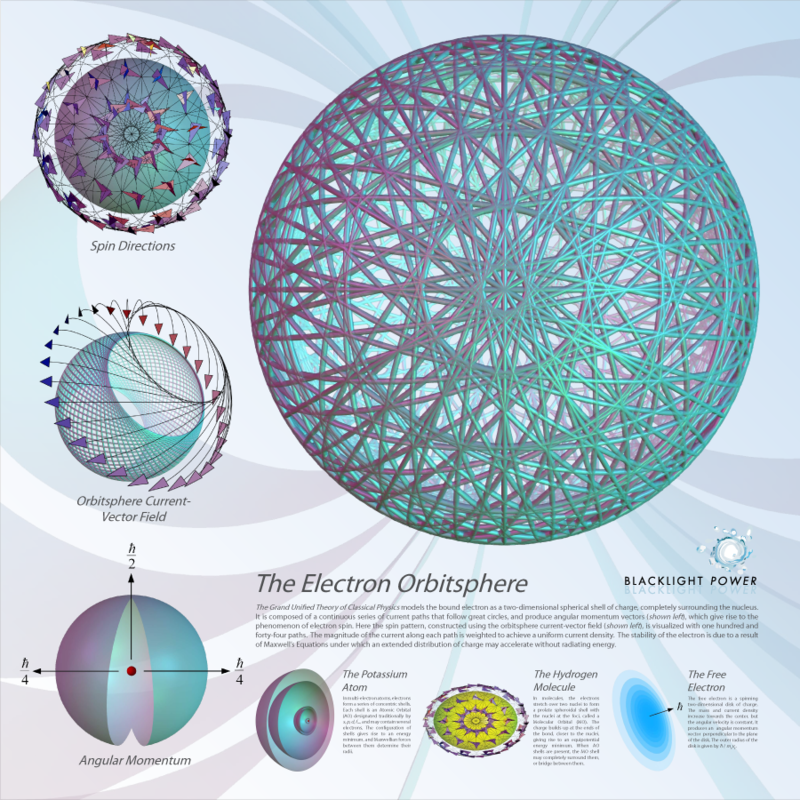 Not actually necessary, as the Mills ideas already pervaded wide branches of physics - but I'm pretty sure, electron orbitals don't look like the hollow spherical shells. The plain spheres cannot explain complex shape of molecules, like the angled character of water molecule. The water calculations of Mills are one page 476 ff. (GUTCP 2016). The angle calculated matches the measure one. The value on your post is that of vapour you will find it in Wiki too. It's a little bit smaller because no Hydrogenbonds must be accounted for. But the Mill's formula provides no correction for the Temperature which influences the average state of water...The Mill's modell is good for a starting point (low Temp), but for the fine structure you need QM. Well, spherical orbital models have been abandoned in 1933 already. Best luck with it. Zephir, you are missing the whole point. Spherical models were abandoned because they did not lead to stable orbits and could not explain many observations. But back then they just used postulated spherical orbits. That were equations solely designed to match experimental data. Of course this failed. Mills is totally different. He starts with Maxwells equations and derives stable orbits that obey Maxwells laws. If you don´t see the difference I cannot help you. That Maxwells equations are valid is known. If Mills claims that he uses just Maxwells equations,Newtons laws and special relativity the only valid answer is to show where his derivations are wrong. All the laws Mills builds upon are valid so you have to show the error and not just state "I don´t believe this.". We are not in church. The orbitospheres are spheres for atoms and ions. If you combine them the electrons of course interact and so they show a more complex behavior. I calculated the water molecule with Mills equations and your statement "The plain spheres cannot explain complex shape of molecules, like the angled character of water molecule." is simply wrong. I am going to post my calculations by tomorrow I think here in this forum. Your second aspect with the microscopic shape is definitely a valid objection. But to take only these pictures as a proof that Mills is wrong is not valid: In these pictures you see through the eyes of very complicated measurement equipment. We cannot judge how this is influencing the results on the screen. And assuming that these pictures are 100% valid it is totally possible to get the same results with Mills model. Of course you have the right to dislike the theory and ignore it for being naive and so on. But than I would ask you to stop reading threads about Mills and stop posting wrong statements over and over again. Of course his theory can explain complex molecular shapes and tomorrow I am going to invite you to use Mills equations to prove him wrong. I don't see the way, how Maxwells equations would lead to stable orbit for electrons if it didn't lead for Bohr. To be honest, I even don't understand, why/how the Maxwell's theory of light should work for massive particle like the electron. In general, whole the orbital physics is governed with quantum mechanics, which is inconsistent with Maxwell equations, which don't support quantization. At any case, the fact something is derived mathematically still doesn't imply, it's physically relevant. Euler did prove hollow Earth mathematically, many theorists did the same later for string theory - without success in subsequent experiments. Time will show us - but in this moment I don't believe nearly anything about Mills. And I still support most of alternative physics: from scalar waves over water clusters to overunity devices just by my physical intuition and knowledge of abandoned evidence. What I would recommend the supporters of prof. Mills is less flame wars in discussions and more actual attempts for replication of his work at both theoretical, both experimental basis. Note that in this matter Randell Mills still strikingly differs from researchers of cold fusion (which isn't supported with mainstream in the same way) - his research is still one man show for bunch of supporters, who accept his work non-critically and without any attempts for replication. This sectarian attitude is what bothers me here. The post was edited 2 times, last by Zephir_AWT ( Oct 27th 2016 ).